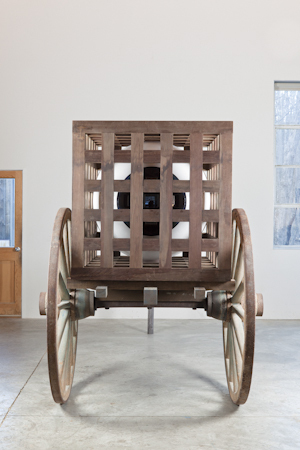 The MCKEE GALLERY is pleased to present new sculptures by MARTIN PURYEAR in an exhibition opening on Thursday, May 3, and continuing through Friday, June 29, 2012. 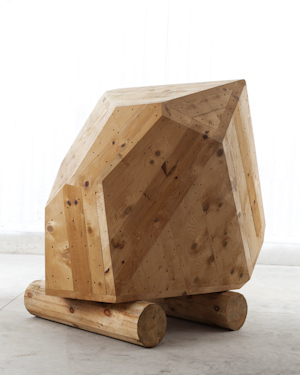 Martin Puryear has always worked with wood. Occasionally he explores the possibilities offered by such diverse materials as wire, tar, steel and bronze but, inevitably, his hands and his instincts lead him to the saw and the plane, to assemble parts to make a whole, whether in the making of sculpture, furniture or canoes. The beauty of a Puryear sculpture is in its finished form, but the art is in the making. He brings vast experience to the craft of carpentry and considerable knowledge of cultural history to his understanding of sculptural form. His works evoke the archaic, the organic, the primitive or the minimal abstract and have a unique way of combining an external appearance of weight and mass with enigmatic suggestions of complex internal structure. 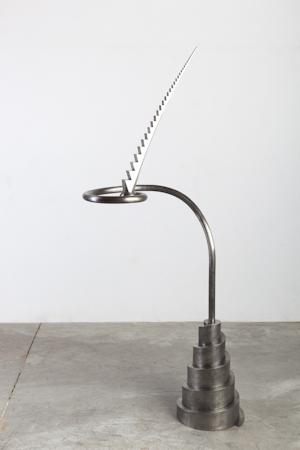 This dichotomy is to be found in his new sculptures which might also pose questions about meaning within the work. Most are supported on wheels which obviously connects them to man. Two sculptures ‘The Load’ and ‘Cart’ are heavy with meaning, going way beyond the power of formal invention. What are they? They remind us, like relics, of human struggle, endless toil and our migratory past. ‘The Load’ has an ‘inner’ eye surveying a journey traveled, watchful of unseen danger as man struggles towards the future. Are they related to personal sagas or beliefs? They have a monolithic presence which traverses the history of time. The earthbound bronze sculpture ‘Heaven Three Ways/Exquisite Corpse’ seems to spiral upwards towards unknown mysteries. This is the first exhibition of Martin Puryear’s sculpture since his retrospective exhibition at The Museum of Modern Art, New York, NY, in 2007-8, which traveled to the Museum of Modern Art, Fort Worth, TX, the San Francisco Museum of Modern Art, CA, and the National Gallery of Art, Washington D.C.
Martin Puryear was recently awarded the National Medal for the Arts in a ceremony at the White House.